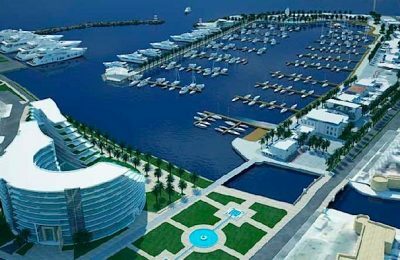 Gammarth is a modern well-developed coastal resort 20 km north of Tunis. It is a stunning place for a holiday with 12 miles of perfect white sandy beaches lined with upmarket hotels, shops, cinemas and all the amenities you would expect at any Mediterranean resort. There is an 18-hole golf course just 1 km away. Sailing, scuba diving, jet skiing and other water sports can all be enjoyed on the beach. However there are far less vendors in evidence at Gammarth than in other resorts such as Hammamet. Gammarth was a small fishing village for centuries. Excavations in Gammarth Hill have uncovered ancient catacombs and Talmudic inscriptions which date back to around the 2nd century when the Romans occupied this area. Following Tunisia’s independence from France, Gammarth became a popular tourist resort. Since the 1950s it has steadily developed and tourism is now the main economy in the area. Overlooking the beaches there are many luxury hotels and European-style restaurants. The forested hillside is dotted with elegant white villas, some of which are used as holiday homes, taking advantage of the many sandy coves along the coast. Some of the most famous villas are Les Dunes and Abou Nawas Gammarth. Gammarth is the ideal choice for a relatively quiet and uncrowded beach vacation within easy reach of historic sights such as Carthage, just 7 km away. For those wanting to explore the area, it is close to some of the area’s cultural sites such as pretty Sidi Bou Said. Just outside Gammarth is the French Military Cemetery which is worth a visit for the breathtaking sea views across the Gulf of Tunis to Cap Bon. Tunis is just 20 minutes away by train and is the best place for shopping. As well as the large souk, where bargaining is the norm, the city of Tunis also has some branded stores where prices are fixed. The Medina is a World Heritage Site and is a great place to explore the narrow streets, alleys and gateways which divide the open markets. This close proximity also means that an address in Gammarth is one of the poshest in Tunisia however it is important to ensure that your in the right part of Gammarth as the northern part is mostly forest and some villas can be pretty cut off from the poshest southern side. I would say the Phebus hotel marks the northern most tip of Gammarth with the Golden Tulip and the residential area to its south of it as the border where it becomes La Marsa. It is this southern part where I would choose to stay if I wanted to walk to La Marsa. Tunis airport is around 20 km from Gammarth with regular international flights from most European cities. The best way to reach Gammarth is by local taxi. Alternatively, hire a car from the airport and drive the short distance along the P9 route. authentic La Residence Tunis, both of which are right on the beach. Most hotels have pools, spas and restaurants onsite and some have Internet and business facilities. However not all five star hotels in Gammarth are quite up to the standard of five star resort in top European cities. Those looking for more local prices and standards will find the three star Acqua Viva more than adequate at a fraction of the price. There are dozens of hotels between the two extremes with something to cater for every budget and taste. Gammarth has many cafés, bars and restaurants in the Zone Touristique. The fish restaurants are highly recommended and comparatively reasonably priced. Le Cap Restaurant is a popular place to eat with a high reputation for its upmarket ambience and delicious food. Other top restaurants can be found in the hotels and offer pleasant surroundings. The Restaurant L’Olivier is well recommended and is within the Hotel La Residence. Most of the nightlife in Gammarth is concentrated in the hotel area close to the beach. It has a good choice of discos and nightclubs but it is far less developed than many other European resorts. Those wanting more variety can travel to La Marsa about 10 km away which has a further selection of local clubs and bars. 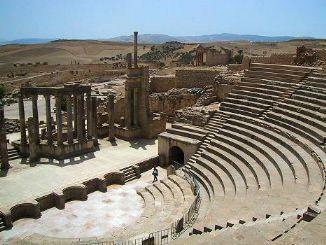 Gammarth has a Mediterranean climate with a hot dry season moderated by the proximity to the sea. During the summer, temperatures reach an average of 32C (90F). In winter it rains every 2-3 days with average daytime highs of 15C (60F). Frost is rare and the area enjoys 10 hours of sunshine per day on average. The town has a bank with the usual counter services. 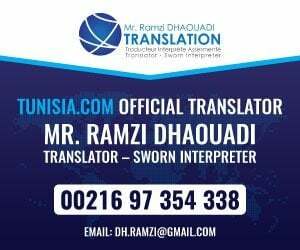 Alternatively, you will have no problem obtaining cash in Tunis which has plenty of ATMs, banks and money exchange desks around the city. Cash is preferred in small local shops, bars and restaurants, but credit cards will be accepted in hotel restaurants and larger shops. Gammarth is easy to get around on foot especially if you are staying close to the beach. A car is recommended for exploring the area but if not, the area has plenty of local taxis. It is usually possible to get a shared taxi to and from Tunis as they run like private buses according to demand. Alternartively use the local TGM train as far as La Marsa and complete the journey by taxi.